Image by Le présent du passé Montréal. via FlickrMajor League baseball came to Montreal in 1969, the same year that a previous expansion team, the Mets, improbably won the World Series. This is the third installment of “Baseball’s Best of the Worst,” a series put together by Graham Womack of “Baseball Past and Present,” and myself. Graham will contribute the fourth part of this series next Friday. Major League baseball came to Montreal in 1969. And just as the expansion Mets of 1962 were an awful team, so, too, were the ’69 Expos. In fact, the ’69 Expos won just 52 games, only a dozen more than the pathetic ’62 Mets. The Expos 52-110 record in ’69 was tied for the worst in baseball with their expansion twins, the Padres. In January of 1969, the Expos, in a cunning trade, obtained Rusty Staub from Houston. He quickly became their best player for each of his three seasons in Montreal, 1969-71, inclusive. Staub quickly became a beloved fan favorite in Montreal. He played with a special flair that delighted the fans, and he was easily the Expos’ best player. In fact, in 1969, Staub set a career high in Offensive War at 6.7, fifth best in the N.L. 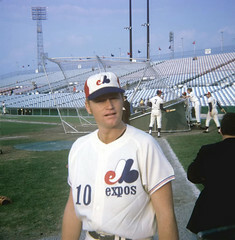 Staub led the Expos in virtually every offensive category in 1969, and was rewarded with his third trip to the All-Star game. The Expos, meanwhile, languished at or near the bottom of the N.L. East during Staub’s tenure with Montreal, never rising above fifth place in that six-team division. In 1972, Staub moved on to the Mets where, once again, the fans adored him. In 1975, Staub set a team record (subsequently surpassed by others) for RBI in a single-season, driving in 105 runs for the third-place Mets. Then, inexplicably, the Mets traded Staub to the Tigers the following season for a case of Gatorade. The Tigers also threw in a used up Mickey Lolich. The Expos, it turned out, were just one of several successful stops along the way during Rusty’s North American Tour, which lasted from 1963 (at age 19) with Houston, until finally ending in 1985 (age 41) with the Mets (for a return engagement). Along the way, he also played in Detroit, Montreal (again) and Texas, appearing in six All Star games in his career. Staub is just one of three players in baseball history — the others being Ty Cobb and Gary Sheffield — to homer before his 20th and after his 40th birthdays. A professional chef, (keep in mind his New Orleans roots), Rusty opened “Rusty’s Restaurant” in Manhattan in 1977. The original restaurant on 73rd street closed, as did its eventual successor on Fifth Avenue. Staub finished his illustrious career with 499 doubles and 292 home runs. He received little support for his Hall of Fame candidacy, though, apparently because the baseball writers to whom the voting privilege is extended prefer nice, round numbers. If Staub had hit 500 doubles and 300 home runs, undoubtedly he would have received more votes. Yet to Expos fans, Le Grand Orange’s 1969 baseball season will always occupy a heartwarming place in their now frigid, baseball-starved universe. I thought Rusty Staub was great. I’ll never forget, at the age of eleven, when I found out that the Mets got Staub from the Expos. Wow, was I excited! And Rusty’s patented “sliding catch”; do you remember that? Slow or not slow, he was a very exciting player. If the Mets didn’t (foolishly) put Dave Kingman at first base and left him on the bench when the two came back to Flushing in 1981, he would have EASILY had 3,000 hits. (I guess that the management put pressure on managers Torre, Howard, and Bamburger to put the guy with the biggest contract at first base, and that would’ve been Kingman). Yes, Staub became a fine role player in the tradition of Ed Kranepool, but he would have been FAR more valuable batting four or more times a day. And it would be interesting to find out what Staub’s fielding percentage and all that was as a first-baseman. It HAD to have been better than Kingman’s. I used to listen to the Phillies games on the radio, and when they were playing the Mets, Andy Musser and Chris Wheeler were joking about Kingman’s ineptness and clumsiness at first base! Of course, Kingman was clumsy EVERYWHERE he played, whether it be in left field, right field, OR first base. (I don’t ever recall seeing him as a third baseman, although I do know that he played there at times, too.) Don’t get me wrong; I loved Kingman, as well, particularly in 1975 and 1976 when he was the first real awesome power-hitter that the Mets ever had (not counting Frank Thomas’s 1962 season), but my fondness of him wore thin when I thought of the fact that he was the reason that good ol’ Rusty was sitting on the bench. Hi Glen, I was a big fan of Rusty Staub as well. I guess they played Kingman at first base ’cause he had the bigger bat, and there really wasn’t any other place for him to play. He once broke his thumb attempting to make a diving catch in left field, so that position was out. His best position would have been D.H., but with the Mets, that was not an option. Staub is one of the 50 best players not in the Hall of Fame. I’m not sure he belongs there, but he was certainly better than several of the guys already enshrined there. I can understand the Expos trading Staub, as it yielded several good prospects. Too bad they didn’t hold onto Singleton longer. For this pitching-rich, offense-deprived Mets, trading Staub made no sense at all. I was at a long extra inning Mets game in 1985 versus the Pirates in which the Mets ran out of position players. They had Staub in left field and one of hte pitchers (i think it was Jessie) in right. They would rotate the two of them for each batter depending on whether a leftie of rightie was at bat. If memory serves Staub made a good catch in left! I saw that 1985 game, got off work at 3pm, heard it was the 8th inning, so stopped at a local pub to watch the end…12 innings later. Rusty came into OF played LF if batter was a lefty and RF if batter was a righty. In the 18th, two on and two out, Rick Rhoden (righty)hit ball opposite field to right, Rusty ran long and slow, caught ball on shoetops on foul line to end inning, Mets won in 19th. Him running back and forth during the innings was a classic! Charley, thanks so much for stopping by and leaving the comment. Cool story! Staub was a great player, always one of my favorites.